When you see it or hold it in your hands, you may know it's a Dean guitar. First created in 1977 by a 17-year-old guitarist, Luther Dean Zelinsky, Dean guitars are associated with the early days of heavy metal bands and the rock-and-roll life. Other guitar brands have tried to copy vintage Dean guitars, but they have not achieved the devoted fan following that vintage Dean instruments enjoy. 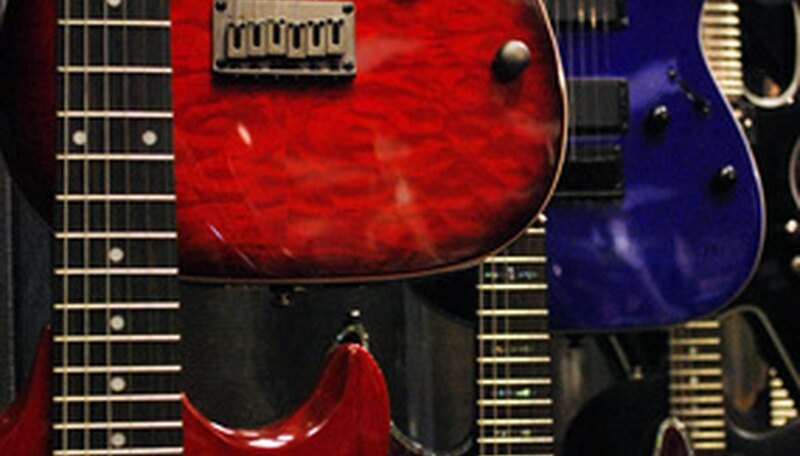 The "Vintage Dean Collection" includes guitars manufactured between 1977 and 1987. Look for a distinctive serial number located on the back of the headstock. Dean guitars made in the United States have a seven-digit serial number. The first two numbers indicate the year the guitar was manufactured. The succeeding numbers are the Dean production numbers. Look for the Vintage Dean's classic V-shaped neck that points up and out the top of the guitar. Examine the headstock and body. Dean's first models, made in 1977, had extremely pointed headstocks and bodies. Check for special characteristics specific to the vintage models. Look for the Dean logo and autographs by Dean on the headstocks. Dan Boone has been writing since 1999. His work has appeared on CaribbeanChannel.com and he wrote for the "Virgin Voice" magazine and its website, Virgin Voices. Boone has a Bachelor of Arts in composition and arranging from Berklee College of Music in Boston. He also holds a certificate in digital-sound engineering from the Trebas Institute in Montreal.